Nokia is tapping into the growth of mobile messaging services after partnering with text chat and voice call messenger Nimbuzz to reach the service’s 25 million users in India, a country where the phone-maker is struggling to maintain its once-dominant market position. The Finnish company is running a series of marketing campaigns over each of the next four Sundays, starting June 30. Each Sunday, it will host a quiz — via a dedicated Nokia Chat Buddy — that puts India-based Nimbuzz users to the test on questions relating to technology, movies, history and sports, with prizes at stake. Nimbuzz says that users who “perform well” will be rewarded with incentives such as discounts for Nokia products/accessories and free merchandise. Users are ranked on a nationwide leaderboard based on their number of correct responses and, each Sunday, Nokia will give a free smartphone to whomsoever is top come the end of the quiz. India-headquartered Nimbuzz — which was originally established in Amsterdam — says Nokia is paying it to run the interactive marketing campaign. The company declined to reveal exactly how much it will make from the deal, but its marketing system is used by a range of other brands to target specific segments and user types on the service. This rollout marks the first quiz, however. The campaign is certainly an interesting one, which pays testament to a couple of things that are shaping the Internet experience for millions in Asia. Mobile is overwhelmingly the platform with which the majority of people in the region will access the Internet. That has helped chat apps like Nimbuzz — which has more than 150 million registered users worldwide and is available on the PC too — go beyond providing a messaging experience and become core Internet and communications platforms for smartphone and feature phone users. Nokia has a strong brand in India — despite recent reports showing that local players, and particularly those offering Android-based smartphones, are rivaling it — and by channeling its efforts through Nimbuzz, a cross-platform service, it is reaching users of not only Nokia phones, but its rivals’ devices too. That means it can tempt feature phone users with the potential to switch to one of its smartphones, and also appeal to those who are using low- or mid-range smartphones and are looking to move up to a premium model. Nimbuzz’s largest market is India, but it still boasts more than 100 million overseas users. With that in mind, it says the Nokia campaign will expand to go international in due course. Nimbuzz’s marketing offering is similar to the ‘official’ account system used by Japan’s Line and Korea’s Kakao Talk. For a pretty penny or two, brands can operate their own accounts which are promoted to user and, when followed, can be used to engage Line users using promotional messages, links to content, etc. Nimbuzz also makes money by serving in-app ads and offering virtual coins that can be used to buy items on its service. The later is popular with many apps in Asia, including mobile games makers DeNA (through its Comm service) and GREE (via its Tellit app). 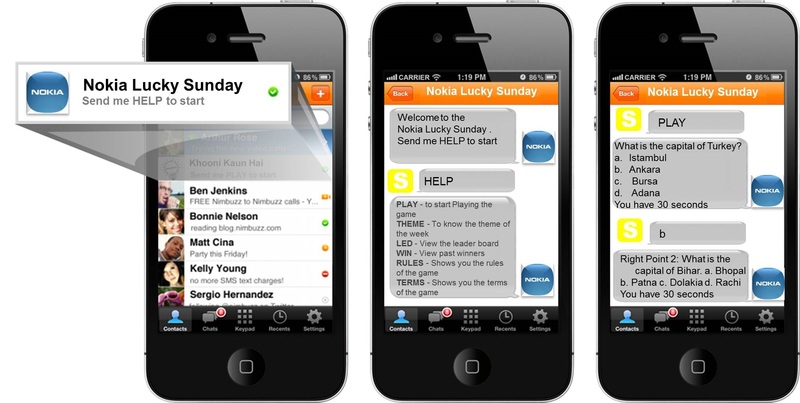 It is still early days in the mobile messaging space, but already there are a plethora of revenue models in the market. Line, Kakao Talk and video messaging specialist Tango are among those offering socially-connected games which monetize through virtual items; WhatsApp uses a $0.99 annual subscription; Path, Line, Cubie and others sell packs of stickers for $2/$3 a set; Line (again — ever the explorer of monetization strategies) is planning to introduce an in app-app store which charges for placements and provides users with incentives to download. Nimbuzz is pitching its marketing offering as a win-win-win — brand interacts with users, users get free things, Nimbuzz makes money — and it isn’t intrusive to the user experience because it is entirely opt-in, and offers real-world benefits. The real question is how much the company is making (which remains unanswered) and how effective the Nokia campaign will be. Nokia’s Chat Buddy, which hosts the quiz, makes its debut tomorrow so we’ll have a better idea of how the campaign went in a month or so.